Congress president, once dubbed by critics as a "reluctant politician", addressed 82 public rallies and seven road shows since October 6. Rahul Gandhi, during his spirited campaign, raised several issues related to people. While political analysts will debate in the coming days the reasons for the BJP's setbacks in three Hindi heartland states, the Congress brain trust has an unambiguous answer -- Rahul Gandhi's newfound campaign energy. 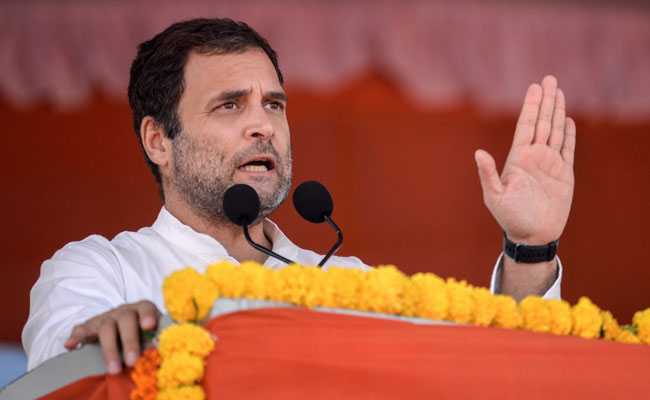 Congress president, once dubbed by critics as a "reluctant politician", addressed 82 public rallies and seven road shows since October 6, crisscrossing Madhya Pradesh, Rajasthan, Chhattisgarh, Telanagana and Mizoram on an almost daily basis. Mr Gandhi, during his spirited campaign, raised several issues such as farmers distress, Rafale deal, corruption, and women's security in all these states. He also raised state-specific issues such as the Vyapam scam in Madhya Pradesh and farmers' suicides in Rajasthan. His promise of a loan waiver to farmers in the Hindi heartland states seems to have struck a chord with the people in villages. "With sheer grit and determination, against all odds, defying state coercion and intimidation, Rahul Gandhi has scripted an amazing turnaround for the Congress in a short span of one year," Congress leader Manish Tewari told PTI. Mr Gandhi was elected unopposed as Congress president on this day. Moving forward into 2019, the results in the state polls will give him the "moral hue" to be able to negotiate an all pervasive alliance in order to see the back of the BJP, Mr Tewari said. Referring to Gandhi's energetic campaign, he said it started off with Gujarat last year, and the Congress chief has demonstrated the tenacity to stay the course over the past one year. Several Congress leaders from the Hindi heartland such as Sachin Pilot, Ashok Gehlot and Bhupesh Baghel credited Gandhi's dynamic campaign as the reason for party's good showing. "Our leader (Rahul Gandhi) has led the team well through the campaign, and results are coming accordingly. We did things right and Rahul Gandhi is the 'man of the match' and the 'man of the series'," Congress leader and Punjab minister Navjot Singh Sidhu said. Sanjay K Pandey, a professor at Jawaharlal Nehru University (JNU) and a political commentator, said Mr Gandhi with his campaign energy has "demolished" the perception of being a "reluctant politician". "This was said about his father also. There is some truth perhaps that Rajiv Gandhi, Sonia Gandhi and Rahul Gandhi had some reluctance (in taking to politics). "He did make some comments which led people to believe that he was not very keen on politics, but now that has changed. Even in earlier elections he has led an energetic campaign, but probably not to this extent," Mr Pandey told PTI. The Congress is set to wrest Rajasthan and Chattisgarh from the BJP which was trailing marginally in Madhya Pradesh in a cliffhanger while the TRS stormed back to power in Telangana and the MNF dislodged the Congress in Mizoram.